President of India Pranab Mukherjee inaugurate the first Rabindranath Tagore Memorial Lecture and Tagore Centre for the Study of Culture and Civilization in Indian Institute of Advanced Studies (IIAS), Shimla today. 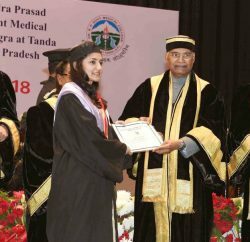 Governor, Himachal Pradesh Urmila Singh was the Guest of Honour. Chief Minister Virbhadra Singh while speaking on the occasion said that Rabindranath Tagore was a multi-faceted personality, a legend and cultural movement in himself who composed National anthems of two Nations, India and Bangladesh, which itself speaks of his calibre. 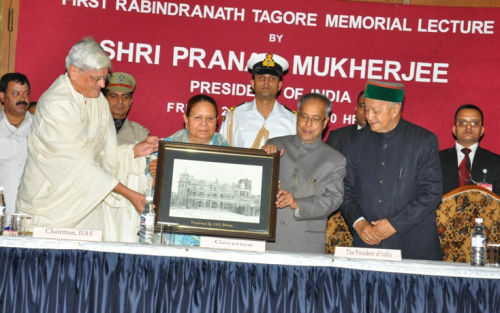 Terming Rabindranath Tagore as a great poet, a philosopher and an artist, Virbhadra Singh said that it was a matter of pleasure to be an audience to the First Rabindranath Memorial Lecture by the President of India who himself was a great scholar and an eminent personality. As the outstanding poet of modern India, Rabindranath Tagore is not unexpectedly referred to as ‘Kaviguru’ in Bengal, but he is equally well-known in the rest of India as ‘Gurudev’, said the Chief Minister. The historic site of Shimla has had the gracious presence of Rabindranath Tagore who stayed here for a while in 1863 at Woodfield, which is quite near to this place, he added. 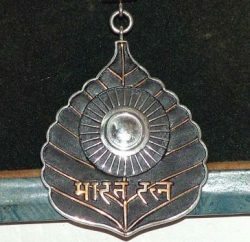 Chief Minister said that for Tagore, the gulf between the educated elite and the masses were undesirable symptoms of modernization introduced by British rule. Soon after establishing Visva-Bharati in Shantiniketan, Tagore laid the foundation of rural re-construction in neighbouring Shriniketan. The mutually sustaining relationship of these two institutions finds extension in Tagore’s vision of Visva-Bharati as resisting the colonial separation of the East and the West and becoming a meeting point of the two, said Virbhadra Singh. He said that Rabindranath Tagore made his school function in the open, in close proximity to nature so that sensuous presence, the seasonal rhythms and vastness could have enhancing effect on children’s minds. Virbhadra Singh termed Tagore as a living institution, who enlightened various spheres of life with his genius. He congratulated the Chairman, Indian Institute of Advanced Study Gopalkrishna Gandhi for successfully organizing the function and arranging Memorial Lecture on the litterateur as Rabindranath Tagore. He extended warm welcome to the President of India and Governor for gracing the occasion. Earlier, Chairman of IIAS Gopalkrishna Gandhi welcomed the President and other dignitaries. Urban Development Minister Sudhir Sharma, Excise and Taxation Minister Prakash Chaudhary, Chief Secretary S. Roy, Chief of Staff, ARTRAC, Lt. General BS Sachar, SM,VSM, Lokayukta Justice L.S Panta, Director, Indian Institute of Advance Studies Professor Peter Ronald Desouza, senior officers of Government of India and State Government were present on the occasion.